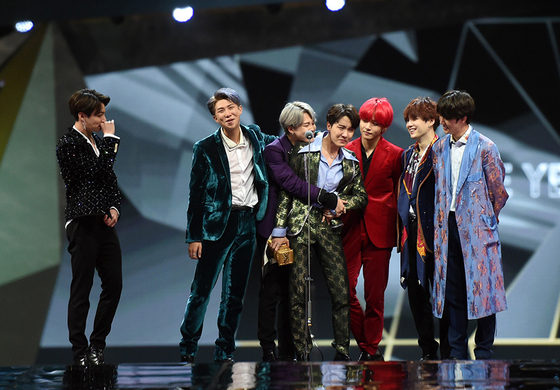 On the 14th at 2018 MAMA in HONG KONG that took place in Asiaworld Expo Arena, BTS won 5 awards: Artist of the Year and Album of the Year, Best Music Video, Best Asian Style, and Mnet Global Choice. MAMA's Artist of the Year is considered to be the biggest award of all 4 kinds of grand awards. 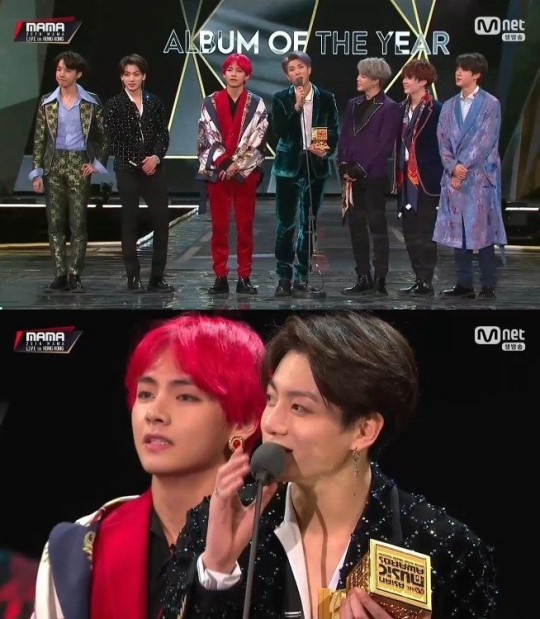 Incredibly enough, this was BTS's 3rd consecutive year to receive the award. 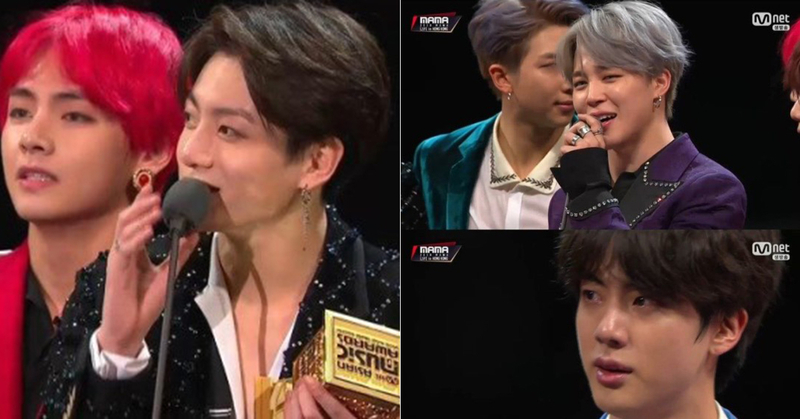 In 2016, when they first attained it, they couldn't contain themselves from crying so hard while saying, "Thank you ARMYs for making our dreams come true". In the following year, they made fans cry by saying, "Wherever we go, people are more curious about ARMYs than us. They ask us how can they be so enthusiastic. It's awesome. We do think that if it weren't for your hospitality, we wouldn't have made it". This year, which is deemed to be the biggest year of their career, they cried once again. They shed tears when they expressed gratitude as they received Artist of the Year, which was the last ward to be announced. Jin said, "We used to consider disbandment" "We are so grateful that we were able to come to fruition like this. I would like to thank members for bracing themselves and also ARMYs for loving us" he added. J-Hope and V wept aloud. 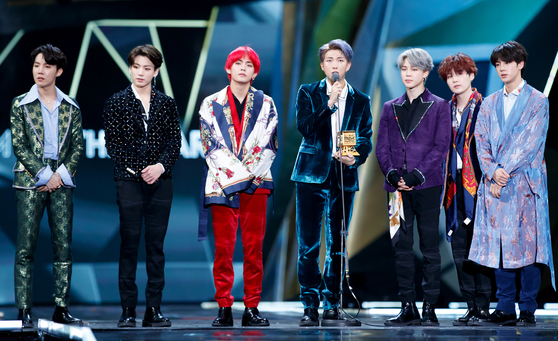 The performances that BTS put on to end the awards on a high note were diverse as well as intense. They started off with Love Yourself, which was musical-like, and the members had a massive stage presence with just a stand and a mic when they performed airplane pt.2. It was followed by O!PUL8.2? LY Remix. In Fake Love, they did individual performances that they acted as if they got shot. Lastly, many dancers were involved in IDOL, creating an overwhelming moment on stage. Including BTS, congratulations to everybody who won awards. VoomVoom always supports each and every K-pop artist!